What happens when your doctor doesn’t listen to you? Or worse, what if your doctor tells you that what you’re feeling is all in your head? What do you do? Who can you turn to? Well, that’s exactly what happened to today’s guest. In her late teens, Allison Post — health coach and author of “The Gut Wellness Guide” —began suffering from unexplainable and debilitating pains and infections. But every time she went to a doctor, she always heard the same thing: Nothing’s wrong with you. They told her to take an antibiotic and some painkillers and wait for her symptoms to get better. Except they didn’t. Pretty soon, Allison’s worst fears became a reality as she found herself in an emergency ward with a 104 degree fever fighting for her life. What happened next changed Allison’s life forever. She’s become an advocate for personalized care and holistic medicine because she understands how important it is for people to know someone is really trying to understand what’s wrong with them. On today’s episode of the Dr. Gundry Podcast, Allison and I discuss her incredible story, what it means to truly listen to your body, and how you can use a few simple tools to radically change your health and your life. WATCH THE FULL PODCAST VIDEO ON YOUTUBE. Dr. Gundry: 00:00 Hey there. Welcome to another exciting episode of the Dr. Gundry Podcast. The weekly podcast where I give you the tools you need to support your gut, boost your health, and live your youngest, healthiest life. Speaker 2: 00:19 Each week, Dr. Steven Gundry, a cardiologist, medical innovator, and author of New York Times Best Sellers, The Plant Paradox, and The Plant Paradox Cookbook, shares the latest in cutting edge health information. He’s excited to be a part of your unique health journey, so let’s get started. Dr. Gundry: 00:37 So before we get into this weeks episode, let’s take a look at our review of the week. Lorib6137 writes, “Dear, Dr. G. Thank you so much for all you do to teach about health. I quote you so much that my kids think I’m obnoxious, but they are listening. Your show on menopause was super helpful. I have listened to it three times. Thank you from your devoted fan, Lori.” So if you want me to read your review, make sure to rate and review the Dr. Gundry Podcast on iTunes. Dr. Gundry: 01:08 So, welcome to the Dr. Gundry Podcast. Today, we’re going to tackle a topic that I’m sure a lot of you are dealing with. I get emails from you, Instagrams from you all the time, Facebook postings. Maybe you feel sick, but your doctors have told you everything’s fine. It’s amazing, particularly you women viewers and listeners, this is a chronic problem that I’ve talked about over, and over, and over again. You absolutely know something’s wrong, but every test at every medical center, at every doctors office is normal, and you’re sick and tired, but you’re sick and tired of people telling you you’re fine. Dr. Gundry: 01:56 You probably, many of you have noticed that you have this gut feeling that something is wrong, but you’re not sure what it means. So many of you are sick, and frustrated, and scared, and as you know, you’re not alone, and you’re not crazy, you’re not depressed. I’ve got a great guest on today, Allison Post, whose got a new book out as you can see here, The Gut Wellness Guide. She’s been an integrative health medical coach for 30 years of experience in Northern California, Marin County. The Gut Wellness Guide is brand new. Allison, welcome to the Dr. Gundry Podcast. Allison Post: 02:47 Thank you. Pleasure to be here. Dr.
Gundry: 02:52 We’re going to back up a little bit. You had a very interesting path to your current mission, as many of us have. This started when you were a teenager. What happened? Allison Post: 03:04 Well when I was preparing to go to college, I got some birth control. I got an IUD, an intrauterine device, and unfortunately the particular one that was being sold at the time ended up two or three years later being taken off the market. It had been defective. It killed 18 women, and there were individual lawsuits that went into class action lawsuits of millions of women that really lost their health, their ability to bear children, because there was proliferative scarring. There were deep problems with this device. Allison Post: 03:48 So I was one of the people that had the device, and I had it for over a year. When I had it at first, it seemed okay, but as I progressed with it, I started to feel uncomfortable. I noticed that I was getting infections. I would go down to the doctor, which in the 70s, your doctor was actually in your building, and like almost a family member, he could come upstairs if you were really sick. He would always look at me and shrug his shoulders and say, “You know, infections are normal for a teenage girl.” He knew I had the IUD. He never really mentioned it. I didn’t really, at that stage in the 70s, doctors were it. They were the authority. Allison Post: 04:36 I was like, “Okay.” He gave me a round of antibiotics, which growing up, was also given out a little bit like candy, right? Allison Post: 05:38 Which I did. I went back up to New York, I went to my doctor, but during this time being in that emergency room, I just kind of settled in to my being. It struck me that I needed to get this thing out of my body. Nobody had mentioned it. I was in college, and I was reading Free and Female and Simone de Beauvoir, and I was starting to understand how we weren’t being seen. Especially being called hysterical and overly sensitive in my era. I went back up home, and I just went to the doctor, and I said, “You know, this needs to be out. This is not the right thing.” He said, “Fine.” he took it out, gave me another course of antibiotics, and I went back to college. Allison Post: 06:31 I went back to my world, and two weeks later I crawled into my roommates room and said, “I am so sick. I think I’m going to die. Can you take me to the infirmary?” I can’t even describe the kind of pain that I was in, but it was body wide at this point. It was centered in my belly and in my pelvis, and I was taken to the emergency on campus. They held me there for three days. Didn’t know what to do with me, but my temperature continued to rise. When it reached about 104, and I was delirious. I don’t remember a lot of it, but they took me to the hospital, and there a doctor said, “Oh, I’ve seen this before.” He had seen women who had had this particular IUD. Allison Post: 07:29 He had seen PID. This was beginning to make tracks. He said, “Let’s see what we can see.” He hooked me up to IV antibiotics, which ended up being almost five weeks long of a course, but saved my life. This is what for, right? He basically told me in really no uncertain terms, that my organs were tanking, that I was on death’s door. He didn’t know what was going to happen, but they were going to see what they could do for me. That’s what happened. I stayed the course at the hospital. The infection cleared up, but I got out of the hospital and went back to school, and nothing was really ever the same. Allison Post: 09:22 I just persevered, and lo and behold, I was 19, yoga was kind of a new deal in the world. They offered a class at my college. I left tennis, and I went to yoga. Dr. Gundry: 09:36 Yep. I saw a picture of tennis in the book. Allison Post: 09:40 I’m a real tennis lover, but I went into yoga, and I learned that I could breathe, and I could move with my breath and feel my whole body, and start to work out whatever had gotten trapped in my connective tissue. I didn’t really understand that at the time, but that was the first inkling like, “Wow. You need to really go on this path, and you need to find out. ‘Cause nobody else is going to help you. You need to find the support where the support is being offered.” I studied yoga, I studied breathing. I got curious, anatomy and physiology. I looked into Ayurveda. Allison Post: 10:28 As I progressed, I met all these women that were in the same boat, and also men that weren’t quite feeling well either. People talk to me a lot. They always have since I was young, so I heard a lot of stories. By the time I was 28 or 29, I’d shifted. I thought theater was great. I loved it, but I feel like this is way more important. This is calling me. ‘Cause I understand that I went from 19 years old to 29 years old, it was like a different world. Part of what happened though, was they told me when I left the hospital that I would really suffer the consequences of this illness. That I would have many surgeries. That they didn’t know how much scarring I had. That I wouldn’t get pregnant, that I was probably fertile. Allison Post: 11:21 Well lo and behold, at 23 I got pregnant when I got married, and I had an ectopic pregnancy. Actually fortuitous, because when they did the surgery they said, “Oh my God.” The doctor had never seen scarring like this. My bowels, everything, was just filled with scar tissue, so you could really see the depth of the damage that this device had caused. That’s what I heard and then I thought, “Okay. I have a lot of work to do.” I didn’t sink. I got a little depressed, of course, and went to see if the other tube was viable, and it wasn’t. I was like, “Okay. My children are going to be people that need my support.” I just went on the path of finding out as much as I could about health, about my body, and about being in a body, so I would have the empowerment to help other people, and continually help myself. Dr. Gundry: 12:25 If somebody comes to you, how do you as a health practitioner translate what you’ve learned into helping someone who comes to see you? Allison Post: 12:41 Well the first thing I start with, and that I’m pretty well known for, is my listening skills because that was the real missing ingredient for me. Nobody could really hear me. It’s as if they had the thoughts before my mouth even opened. “Oh. I’ve seen what she’s coming for. I have a pill for that.” That’s not how I work. I’ve been a massage therapist, a body worker, a craniosacral therapist for 23 years, so I educate people somatically. The health coaching is kind of the icing because there is so many more things in your container. Allison Post: 14:18 I look at everything. I look at their fitness, I look at what’s happening with their diet. What their culture is bringing to that. I don’t jump on them, I just find out. I let them roll the story out, and then we can gently and slowly unwind what’s happening there that’s keeping things not working, and start to roll out what the plan could be, but a collaborative plan. Allison Post: 15:08 I’d like to get him on my table. I wonder. Dr. Gundry: 15:15 Yeah. I don’t think either of us would recommend mothers, or if you’re pregnant, smoke and drink. Listening to you, I couldn’t resist. Allison Post: 15:28 He’s the exact same age that I am. That is our era. I say in my book, “I think my mother’s favorite food group was sugar and baked goods.” That’s what we were growing up on, and that’s what was happening there. We need to unwind to see what’s happening from the beginning, and then we can move forward. Dr. Gundry: 15:53 Yeah. There’s a quote in your book that really stuck out with me. You write, “One reason we do not trust what our body is telling us, is we don’t like what it has to say.” How can a person learn to listen to their body, number one. Second, how can people push past those worries of what their body is telling them? How do you do that? Allison Post: 16:25 Certainly and slowly. Part of the work besides getting people the support they need to understand diet, to understand what they really need in their sleep. They need to understand that we have a very ramped up culture, and nobody can slow down. What’s happening? Everybody’s walking around, always with a device, always online, not in their body. They’re eating in the car, they’re rushing from appointment to appointment, even with their children. I work with kids, so these children don’t even have half an hour for lunch anymore. Allison Post: 18:01 It’s a slow unwinding process of learning how to be in your breath, how to have a support, so that you can co-regulate with somebody and learn how to self regulate. Just how to be in your body, be in your breath one step at a time. Because then you don’t have to push past anything. You can learn how to unfold something gently and slowly. We don’t do it all at once. Just like we don’t introduce everything in the diet all at once. We get educated, we start trying things out because you can’t overwhelm people, but you can get them there because that’s what I’ve seen for over 30 years. Dr. Gundry: 19:18 Once you start doing that you mention, “Well, then we need to talk about what to eat.” You write in your book about the connection between the gut, and our emotional wellbeing, which I’ve written extensively about and there’s more to come. Do you an interesting story to share about this connection that you can give us an example of? 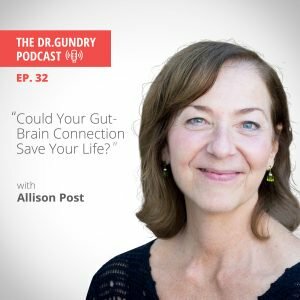 Allison Post: 19:47 Dr. Gundry, I could tell you thousands of stories because emotions are such a big percentage of why it goes awry in the gut. Because there is a system, the vehicle system, that there is a connection. The neurotransmitters are in the gut, and if the gut is seriously impaired, it’s going to affect the way people feel. They’re going to get depressed. They get anxious and vice versa if they’ve grown up in a family dynamic, or in an area that has had a lot of trauma. Even if they’ve had the most pristine diet, they’re going to really be affected. 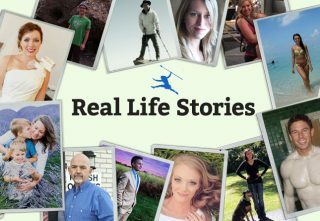 Allison Post: 20:28 I have a lot of stories in my book. The first thing that comes to mind to me is a woman who had fibroid tumors, and really harsh digestion. She just couldn’t digest anything. She’d had her children, she was in pain, she was bloated, everything was happening, the brain fog. She was referred to me, and she told me her story, and I just held her to teach her how to touch her own belly. How to gently breathe, how to open up into her ribcage, which is where her organs are, and how to try to help herself so gently reduce the stress that was in her center. Allison Post: 22:04 I said, “Well, call me. Make sure you stay in touch. You’re welcome to come in again, but here’s a practice for you. Here’s something that you can do every day to keep connected,” and she continued it. Two or three weeks later, she contacted me and said, “Wow. I’m not having a hysterectomy. I’ve already gone in and my fibroids are shrinking. I’m digesting better, but what I …” and she just gave me the roster of what had happened in her life that she had to hold back. She didn’t feel comfortable about her belly, she was embarrassed with it. She was married, she didn’t even like her husband to see her belly. Allison Post: 22:48 It had been a difficult, emotional journey for her. So you see that when people start to contact their bodies, their breaths, and feel held and supported in it, that there’s time. We have the time to do this. Then the connection is made and suddenly the light comes on, and the digestion does change. I mean, I can go on from children, from infants, to people that are 90 that this happens over and over again. Dr. Gundry: 23:23 You mentioned that you had her focus on her belly, and you talk a lot about belly breathing in the book. I know that’s a core principle of yoga. What are some of the tips that you can share with people to guide them in good belly breathing? What’s one take away that people can get from you? Allison Post: 23:44 I think the most important take away is that we want to use the least amount of effort because so many practices are breathe deeply, and it becomes a musculature. It becomes an effort. We can’t get out of hypervigilance if we’re going to try really hard, and we’re going to judge ourselves, and we’re going to think, “This is the perfect way to do it.” It’s a soft, gentle, slow thing. If you start just with belly breathing, and you breathe in through your nose, down your throat, and gently just feel the expansion. Allison Post: 24:28 You let your belly know that you’re giving it this life giving oxygen, but listen to what your belly has to tell you. Where is the restrictions? Does it hurt somewhere? We don’t want to push into it or push past it, we want to honor it, feel it, and then have a practice. Every day, we’re going to return and we’re going to effortlessly breathe, soften, be in our belly, and in a weeks time we’re ready to move on to another technique to reduce the stress in the belly. We just start simply. Simple, simple, gentle, gentle. Dr. Gundry: 25:10 Humor me. My lungs are in my chest, so how can I breathe through my belly? Allison Post: 25:17 Well, you don’t really breathe from your belly, Mr. Doctor, which I think you know well. When you send the air in the right direction, your diaphragm is your breathing muscle. It’s actually moving down and expanding your ribcage laterally so that there’s a pressure system that starts to move into your belly that fills your lungs up. I could draw it for you. It’s [crosstalk 00:25:46]. Dr. Gundry: 25:46 And you did actually in your book. Allison Post: 25:51 [inaudible 00:25:51] Yes. It’s like, “Yes. We fill lower lobes of the lungs. We get more oxygen in our lungs, because we’re actually utilizing the mechanism.” Most people, as I think you know, are breathing up into their chest. They’re … they’re panting fast through life. They’re in that hypervigilant state, so again, we’re back to the unwinding. How do we unwind the tissues, soften the body, slow everything down so we can return to our birthright, which is inherent health and which is the proper way to breathe. Even if it happened to you when you were a little baby. Your body knows somewhere how to do this, and we can hold a space for that. Dr. Gundry: 26:42 Clearly, as you know, and I know, a lot of conventional medicine is failed us in these areas. Certainly a lot of the wisdom of the East is incredibly useful in this area. What do you say to your naysayers and critics that all of this is very unscientific? You’re laughing, so I know you’ve been told this. What do you say about that? Allison Post: 27:16 It used to happen a lot more because there’s a tremendous amount of science now, and we have doctors like you, frankly, who are bringing it forth and sharing it with a wider audience. People want it, so they’re going to their doctors now and saying, “But, I heard Dr. Steve Gundry,” or, “I know Chris Kresser.” Whatever is happening, they’re like, “I go to this woman who taught me this. I feel a hundred times better.” I think we’re being supported more, but I listen to the naysayers. Not many of them connect with me because they’re primed for me. They’ve read my book. Allison Post: 28:00 I have a book from 15 years ago, and they’ve been told, “Oh. This woman.” We’re lucky when people know about us a little bit. I do feel that when that happens, I’m willing to listen. I’m curious, what is it that you think is unscientific? Let’s have a conversation about it. That way, maybe I can allay your fears. Maybe I can show you some literature, or turn you onto an MD that will make you feel safer. People just need to feel safe. The science is so there now. It’s incredible. Dr. Gundry: 28:41 Yeah. My next book is The Longevity Paradox, which will be out at the end of March. Allison Post: 28:47 I can’t wait. Dr. Gundry: 28:48 There’s a lot of fascinating information about the effect of meditation actually on changing the gut microbiome. Yeah. There’s some really cool studies of people who are on a waiting list for a meditation center in Northern California versus people who actually went to that center, and following their healths, and following their gut microbiome over a period of time. All of these people actually well intentioned, they all wanted to do this, but one group got taught meditation and the other didn’t. It’s fascinating. Dr. Gundry: 29:33 All right. Let me take you back to almost the beginning with you. Do you feel that learning the technique of belly breathing was one of the real big impacts on turning your health around way back when? Allison Post: 29:51 It was the starting point for me to be able to have my nervous system come back into balance actually because I was scared of pain. I was scared of everything. And my system was so ramped up. So the belly breathing that I learned, and then I took on myself, was a very slowed down, it helped my nervous system slow down. Then I had teachers who taught me how to use the entire mechanism. My cortisol levels came down, and I could start to feel honestly what the choices I needed to make for my exercise, for my diet, in my relationships. Allison Post: 30:33 Everything came from that. It’s not a cure, it’s on the road to understanding what we can do to help ourselves. The sun came out for me when I could finally go, “Oh. I’m not anxious.” I was so anxious. There were so many things happening in my nervous system, and I became neutral. I could feel my health again, and then I knew how to further unwind what I needed for myself. This is an introduction, especially for people who have no idea to get out of the loop of hyperactivity and trauma so that they can participate in your program even better. Allison Post: 31:17 Things will settle, or they can even know how to choose that out there because they’re not always listening. Right? Others. Dr. Gundry: 31:28 Okay. Our listeners, mom works, dad works, the kids have 27 after school activities like you mentioned when we started. They’re rolling their eyes going, “Wait a minute. I don’t have a meditation room in my house. I don’t have the time to go down to a meditation center.” When they wake up in the morning, before all hell breaks loose, can we belly breathe in the bedroom? Can we do it in bed? Help us out here. Allison Post: 31:59 I’m helping you, and you’re wonderful because that’s what I teach. First of all, breathing is something we do day and night. If we can start to wake up in the morning and then before we go to sleep, those two areas where we’re in bed, and hopefully we’re going to stay there for at least an hour before the baby starts crying. We get these moments. It doesn’t take long to slow down. Especially if you have a structure to do it with. You’ve had somebody teach you something and you’re like, “Okay. I’m going to be here with myself.” Five minutes. Is start people sometimes with three minutes because that’s the unwinding. Allison Post: 32:42 How do we get this into our life because honestly, Dr. Gundry, once people start on this, they’re amazed. Everything’s easier or, “Oh, they do have time,” or they can make space, or children. I’ve gone classrooms with second graders and taught them how to breathe. I’ll say to them at the beginning like, “It’s kind of funny isn’t it? I’m teaching you how to breathe.” They’ll all be raising their hands like, “No. I have asthma. No. My mommy probably doesn’t breathe. I need to teach her.” It becomes a familial … the family dynamics have to be included. Everybody starts doing it together. Allison Post: 33:27 Then we have the field of your life. Your life can slow down because guess what? As you know, we can do a lot more when we’re not hyped up. We get so much more done because we make choices, and we can actually focus, and be in our body, and be in our passion, and not waste our time, and not get angry. We can be angry and deal with that, but we don’t have to flare into something that takes an hour away from our life. It branches out into so much, but we start it like I said, so slow. Just honor people. You start where they are. You can’t pile stuff on. Allison Post: 34:17 They’re not going to go for a 10 day [inaudible 00:34:20] retreat at the beginning, but I have to say they do end up going. Let’s get them ready for that so they don’t trip out there. Dr. Gundry: 34:30 Okay. All right. I got one more thing to ask you. Folks who are listening or watching, we’re going to go deep into the bowel to one of our favorite subjects. Let’s talk about poop. Dr. Gundry: 34:53 What can people learn from their stools. Should we be reading our stools? Allison Post: 34:59 Well, you should definitely be looking. Yeah. It’s a great way to monitor what you’re doing, and what’s working and what’s not working. Certainly you should be having the stool to look at every day, at least once. People can really learn what they’re eating because there’s a transit time. There’s a way that the body can tell you through your stool, “Yeah, I didn’t really like that. I’m not going or I’m going too much. I’m dry, I’m damp.” What’s happening? You can find out so much through your poop. Allison Post: 36:13 That’s a good one. Dr. Gundry: 36:15 Dr. Terry Walls, whose become a very good friend, who cured herself of MS with food makes a very good point that she thinks all of us should eat seven cups of vegetables every day. Dr. Gundry: 37:06 Everything will be okay. Allison Post: 37:08 Exactly. I agree. Dr. Gundry: 37:10 All right. Allison Post: 37:10 I do eat at least seven cups of vegetables a day. It’s actually my favorite food. We’re lucky in California to have such a bevy of vegetables. Dr. Gundry: 37:23 I came from the Midwest and the south originally, and with the frozen products that are now available, year round, organic, there’s less and less excuse to say, “Well, you people on the coast, you’re different.” Yeah, we do have access to great stuff year round, but it’s now available … I go back to the Midwest and south all the time, and go through stores, and go to restaurants. They’re there. We just have to educate everybody about it. Allison Post: 38:00 I’m with you. Dr. Gundry: 38:02 All right. As you know, I get an audience question every week. Dr. Gundry: 38:10 We’re going to go right into that. M. Monroe asks, “I’m a shift worker. 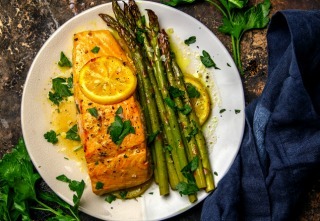 Do you have any helpful suggestions on how to maintain a healthy diet? I.e. fasting, supplements, when to eat, et cetera.” This is a great question. Shift workers, as you know, as a shift worker are some of the most unhealthy people in the world. I know this first hand as a heart surgeon, a cardiologist for a long time, and also as a scrub nurse in college and medical school when I worked the night shift. I also worked the night shift in emergency rooms. Dr. Gundry: 38:56 Night shift work is some of the most dangerous work there is for your health. Everything gets screwed up. Your circadian rhythm gets screwed up. Your day/night cycle gets screwed up. When we’re tired, the things we turn to to help us out, are simple carbohydrates. It’s like burning jet fuel. I can tell you, that’s one of the reasons I got 70 pounds overweight, because I had to have jet fuel all the time to try and stay awake. I think there are really good steps to do this. Dr. Gundry: 39:35 One of the things if you’re a shift worker, when you go home you have to have a completely darkened room to go home to. You have to arrange that bedroom that it is black. It’s easy to do, there are black out curtains, there’s black out shades. That’s number one. Number two, don’t fall into the trap of needing lots of caffeine and lots of simple sugars. I mean, I went to so many Ding Dong dispensing machines, and Hostess cupcake machines in the middle of the night in the hospital. Don’t do that. Bring some nuts from home. That works great. Dr. Gundry: 40:20 There is lots of ways to get a little MCT oil in your purse, in your pocket. You can even get coconut packets of coconut oil in packets that you can take to work. These will give you the energy you need without killing you. So those are just a couple of really good tips as a former shift worker. For 20 years, I continued to work nights and maintained my lower weight. I can do it. You gotta do something ’cause it’s killing you as a shift worker. Allison Post: 40:58 Depending on their circumstances too, if you can introduce some structure. Can you wake up two hours before that shift and get a rocking, fueling nutritional breakfast? Can you come home and have a good, small meal. For me, take at least 12 hours without eating so that your body can rest and repair. We can get a structure happening, and that way that’s the unwinding. That’s a step. I agree so much with you about the black out curtains. We can introduce … I also was in the theater, and I was a restaurant person, doubled up. Allison Post: 41:42 I worked sometimes ’til three o’clock in the morning as a bartender, if you can believe that. Yeah. You had to find a way not to have a cocktail to wind down. That’s the last thing you want to do to yourself because you’re not going to have good sleep. The chemicals in your body, it’s all screwed up. There’s so many things people can do, but until we would know this shift worker personally, I would be reluctant to talk about supplements, except what you’re talking about. Allison Post: 42:16 Take the MCT oil with you. Introduce the vegetables because we don’t really know what’s going on for that person, and I would wait for that part. Dr. Gundry: 42:28 Great. All right. That’s going to be it for today. Allison, where can readers find you and your work? Allison Post: 42:37 Well, they can find me online at allisonpost.com. I am on Facebook, Instagram, LinkdIn. I have an online program coming out next month, that is actually a video/audio worksheet that goes the book so people can actually learn these things. ‘Cause I do work with people all over the world online. I wanted to give them a way to do this in their own home, at their own pace. So that’ll be coming out. Allison Post: 43:07 Hop on my website, get in touch with me. I’m happy to answer questions, ’cause this is why we write. This is what we do. We really do want to help. Dr. Gundry: 43:18 The Gut Wellness Guide is everywhere? Allison Post: 43:22 Every bookstore, on every online purveyor. Dr. Gundry: 43:26 Okay. Very good. Well, thanks a lot for joining me. Good luck with the book, and good luck with the online program. That’ll be great. Allison Post: 43:36 Thank you so much. It is such a pleasure. Thanks for inviting me. Dr. Gundry: 43:39 Thanks again for joining me on the Dr. Gundry Podcast. We’ll you see you next week. Tune in, because as you know, I’m Dr. Gundry and I’m always looking out for you. Dr. Gundry: 43:51 Exciting news, my friends. My new book, The Longevity Paradox, is out now. Like The Plant Paradox, this will be a game changer in helping you live a long, vital life. So pick up your copy now at your local bookstore, Barnes and Noble, or Amazon, or my audio book, which I actually recorded this time. Make sure you tell your friends and family about it. Dr. Gundry: 44:16 For more information about this weeks episode, please take a look at my show notes below, and on drgundry.com. In the show notes, you’ll also find a survey, and I’d love to find out more about you. Please take a few minutes to fill it out, so I can do my best to provide information you’re looking for. Dr. Gundry: 44:35 Thanks for listening to this weeks episode of the Dr. Gundry Podcast. Check back next week for another exciting episode, and make sure to subscribe, rate, and review to stay up to date with the latest episodes. Head to drgundry.com for show notes and more information. Until next time. I am Dr. Gundry, and I’m always looking out for you.